Polyethylene Terephthalate (PET) Definition: PET is the chemical name for polyester and is a lightweight, clear, and strong plastic used for packaging beverages and foods. Although you may see labels on the best bottled water products in the market such as from groundwater or springs, many of these companies utilize tap water, filter it, seal them inside plastic bottles, and sell them to you. According to a recent report from Food and Water Watch, 64% of the bottled water came from municipal tap water sources. This means consumers are unknowingly purchasing water that they can basically get from their faucet. 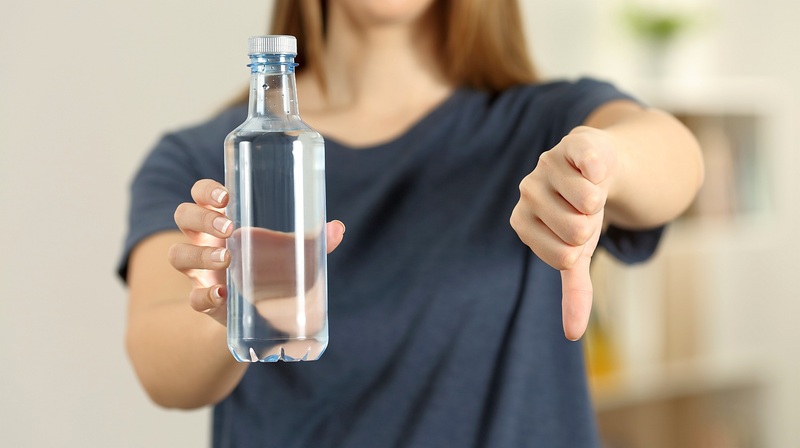 Is bottled water safe? Despite the fact that many plastic bottles are BPA-free, other toxic chemicals in the bottle can cause harm to your health, especially when the bottle is exposed to heat or when it is sitting around for a long period. Fluorene-9-bisphenol (BHFP), for example, is often present in plastic bottles. A study found that this chemical in mice causes miscarriages and uterine problems. This chemical may have negative health effects on animals, but it’s still not clear if it has the same effects on humans. BHFP works by blocking estrogen levels in the body, which may lead to depression and mood swings. Fluorene-9-bisphenol (BHFP) Definition: It is a chemical substitute for bisphenol A (BPA) and is widely used in plastic production. This reason connects to the first point when plastic bottles degrade over time that can release toxic chemicals to the soil. Although this effect may not have an immediate impact, plants in contaminated soils may absorb these toxic chemicals that can transfer to the harvested foods we eat. This situation may continue to future generations if we constantly utilize plastic bottles and don’t dispose of them properly. The manufacturing process of bottled water costs more than gallons of tap water. About 90% of the manufacturing cost goes to making the bottle, cap, and label, which does not have to do with the water. Aside from that, costs from store shelf space, transportation, distribution, and production add to the expense, which again does not have to do with the water. Plastic pollution in the oceans and seas is growing despite the many efforts of authorities warning citizens to be responsible for their waste disposal. Because of this human behavior, our oceans suffer from the plastic garbage we dispose. This results to fish and other marine animals to suffer — accidentally eating plastic garbage or getting caught by the garbage that can lead to their deaths. Because we also eat fish and other seafood, this situation also affects us. Some fish with traces of chemicals from the plastic they eat will be consumed by us, too. Manufacturing of plastic that uses natural gas or petroleum requires a large number of natural resources and energy. In the U.S. alone, plastic bottle production needs more than 17 million barrels of oil. Not only that, the energy from vehicles that transport these bottles also uses natural sources. This actually doubles the amount of energy plastic bottles consume, from production to distribution. Some water bottles use petrochemical plants during the manufacturing process, and these plants produce harmful contaminants in the air, such as carbon and sulfur. This pollutes the air that can affect the citizens, and even animals, who live near the production area. Phthalates used in the making of plastic to make it soft and flexible easily migrate into the air that both humans and animals breathe, which is harmful. The chemical’s smell is that of a new shower curtain and a new car. Petrochemical Plants Definition: These are plants that convert natural gas, oil, and minerals into various products for an array of applications. Phthalates Definition: These are a cluster of chemicals responsible for increasing and softening the flexibility of vinyl and plastic. Although authorities encourage citizens to recycle plastic, American consumers do not typically reuse them. Estimates say that more than 80% of water bottles in the country become litter. As a result, these waste plastic bottles end up in streams and other waterways and on beaches and roads. The government pays millions of dollars annually to clean up plastic wastes and dispose them. At some point, some bottled water can sit in the store shelves for months, and this allows mold, algae, and yeast to develop over time. Mold, for example, can grow on plastics when there is continuous moisture, especially when exposed to the sun. Also, in some cases where bottled water was not sealed correctly where air can easily enter and there are more mold-baring contaminants in the water, the possibility of mold growth is high. Exposure to molds can increase the risk of developing allergies, depression, and asthma. EPA tests tap water for Escherichia coli and other bacteria, which is a standard stricter and higher than that of the FDA. The agency makes sure to protect the public from water contaminants in public water systems that can harm them. With these facts about bottled water, it is clear that the constant drinking of water from plastic bottles does not only cause harm to human health but also to animals and the environment. If you decide to switch to drinking tap water, you can always make it even healthier by getting your own water ionizer and converting regular water into alkaline water. Save yourself and the planet now from plastic harm by changing back to drinking tap water filtered by a water ionizer machine! What other things do you know about bottled water vs tap water that you like to share with us? Let us know in the comments section. Up Next: Does Alkaline Water Beat Bottled Water? ← 5 Simple Tips to More Beautiful Skin with Dr. Lori!